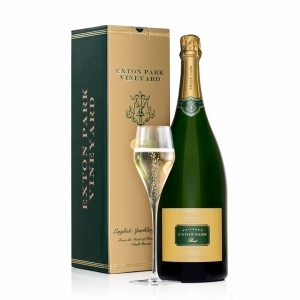 Exton Park has announced the launch of their Brut Reserve NV in Magnum. The addition of this Magnum size to the existing 75cl and innovative 37.5cl half bottles, completes the ‘family’ of the vineyard’s flagship, and award-winning, wine. Presented in an elegant gift box, the Exton Park Brut Reserve NV Magnum is the ideal size for a party or a particular celebration. Announcing the news, Head Winemaker Corinne Seely says: ‘I have been working on these special Magnums for some time, and I’m very excited to be able to release them at last. It is important to have one of our key sparkling wines available in a range of sizes, and for many different occasions. It also shows how Exton Park continues to innovate and to try out new ideas in this fast-developing category. The rich complexity and lingering minerality of the Brut Reserve lends itself perfectly to this range of bottle sizes. Exton Park Vineyard has established itself as an English Sparkling Wine producer dedicated to terroir expression and the development of a distinctive style of wine. Now, through their flair for innovation, their customers can enjoy the Brut Reserve NV in Half Bottles, 75cl bottles, and Magnums. The new limited edition Brut Reserve NV Magnum - grown, vinified, bottled and matured on the estate - will retail at £65.